Rinse quinoa in the strainer under cold water until the water is clear to wash out the bitter substances. Bring the quinoa, almond milk, and orange juice in a small pot to a boil with the cinnamon stick over high heat. Stir and then simmer over low heat for approx. 15 min. Stir often. Chop dark chocolate. Once quinoa is cooked, remove the pot from the heat, remove the cinnamon sticks and stir in the chopped chocolate until it has melted completely. Let it rest for approx. 5 - 10 min. with the lid covered until the quinoa has absorbed almost all of the liquid. If the quinoa mash is too thick, add more almond milk until the desired consistency is achieved. 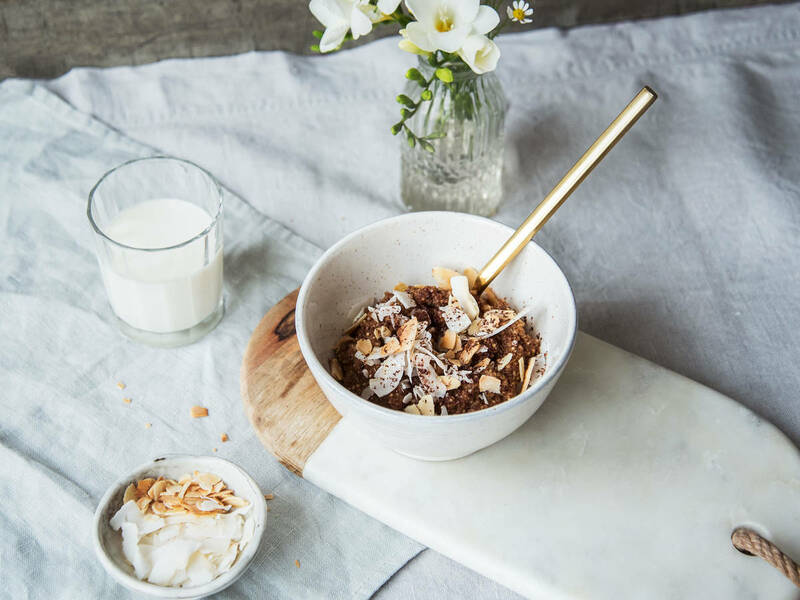 Serve quinoa in bowls, garnish with chocolate shavings, coconut sugar, and toasted coconut flakes. Enjoy!